Welcome to The Fourth Wall, CHIRP's weekly e-conversation on cinema. 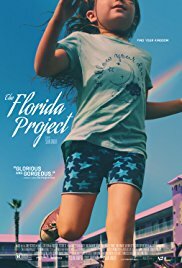 This week's subject is the film The Florida Project. This edition is written by CHIRP Radio volunteers Kevin Fullam and Clarence Ewing. After seeing the terrific films What Maisie Knew and Moonlight last year, it struck me how rare it is for directors and screenwriters to capture authentic views of the world through the eyes of a small child. So often, when we see children on screen, they're essentially mini-grownups, with dialogue that's far too mature for their age*. Part of the issue is that little kids are rarely good actors, but also, how else would you keep their characters involved in adult-oriented plots that, in the real world, would likely mean zilch to someone that young? In The Florida Project, six-year-old Moonee (Brooklynn Prince) seems nothing if not genuine. Moonee, a charismatic girl who isn't quite worldly enough to realize that her low-end motel room and minimal supervision don't exactly bode well for her future, spends her summer days as a ringleader of a small group of kids her age in the area. They wander the streets, play in abandoned homes, and creatively beg for money for ice cream (one boy earnestly states that he "needs ice cream for his asthma"). Uh, did I mention they're six years old? I don't know how much of their dialogue was ad-libbed, but when they're around each other, these kids sound like kids, without a hint of self-awareness. Of course, one isn't sure how much better off Moonee would be at home, considering the nominal parenting she receives from her chain-smoking mom Halley (Bria Vinaite), who resorts to grifting (and worse) in order to raise the cash necessary to placate motel manager Bobby (Willem Dafoe). Dafoe is one of the few cast members who isn't a first-time actor, and we feel for his Bobby, who is a gruff-but-kind soul in a thankless job that serves up a neverending series of fires to quell. In TFP, director Sean Baker delivers something closer to fly-on-the-wall cinéma vérité than a traditional narrative**. There is a powerful climax that is subtly set up along the way, but until the conclusion of the film, we're not actually sure where it's headed? Throughout the story, though, Halley skirts the law (and good sense) via a number of risky ventures, and we instinctively can guess that it's only a matter of time before her chickens come home to roost. How many people are out there, living on the margins like Moonee and her mom? What might we guess happens to Moonee as she gets older? And how much is Halley to blame for their predicament? Does Baker elicit sympathy for Halley's desperate plight, or scorn for her petulant attitude and what seems like a near-abdication of responsibility? I thought about these questions long after the film ended, which is a testament to the power of TFP. Clarence, what did you think about the film? How did you view Halley, especially vis-à-vis Ashley (Mela Murder), the mom of one of Moonee's friends? And what did you think of the setting, with the action taking place just outside the majestic environs of Disney World? I’ve also been thinking about this film a lot since I saw it a few days ago. Overall, I liked it, but I do have some thoughts about aspects of it. The underlying economic commentary is pretty clear. In fact, the movie’s title is what Uncle Walt called Disney World while it was under construction. One could easily add an “s” at the end to put an even finer point on it. No doubt, the images of this group of people living on the molted remains of a billion-dollar entertainment empire are powerful. The regular appearance of the helicopter flying over the motel as it ferries theme park VIPs back and forth is a fantastic visual metaphor of the gulf between the haves and have-nots. I’ve been reading some reviews that criticize Bria Vinaite’s performance as lacking depth and being too shrill, but that’s exactly the point. This is a young woman who, for various reasons, has her social skills permanently stuck on “hostile” and lacks the emotional tools needed to deal with her problems. In my day job, I’ve had many interactions with people in situations like Halley’s. Let me tell you, Vinaite’s portrayal is spot-on. Why does she act like that? This is where the film is lacking. Sean Baker’s in-the-moment vérité style is begging for some context. It’s very easy for us as viewers to sit back and condemn Halley’s bad decisions. But outside of what is seen and heard in real-time, we know nothing about her. Where did she come from? How did she end up there? This kind of information would have been useful to help deepen the understanding of what’s going on. Also, I feel there’s is a distinct lack of grit in this movie. The kids are uniformly adorable and manage to get into dangerous situations that are more adventuresome than unfortunate. I have to remind myself that this is not a documentary, but where’s the kid who’s always filthy because his parents are too strung out on Oxycontin to bathe him? Or the one who doesn’t want to go out wandering around with her friends because she hasn’t eaten anything for two days? For millions of Americans, that’s what it’s like to live on the edge. While Baker’s definitely not glamorizing poverty, in some ways he’s, dare I say it, “Disney-fying” it to a certain degree? Am I being unfair? Acting-wise, I agree with you that the children did a good job of being children on film. My all-time favorite performance by a child actor remains Haley Joel-Osmet in The Sixth Sense. Do any come to mind for you? As far as other child actors, I mentioned Moonlight (especially Alex Hibbert as "Little" Chiron) and What Maisie Knew (with Onata Aprile as the title character). The films presented diametric opposites in terms of the children's living conditions, with Maisie being shuttled between NYC luxury condos while Chiron navigates a Miami slum. Both were mistreated in their own ways, but you got a sense of resiliency within the kids, as well as the ability to largely adapt to their situations. I'd put Prince's Moonee in the same category, and you're right, Osmont's performance in The Sixth Sense was outstanding as well. 1) If she's not scarfing down greasy pizza in her motel room, she's begging for ice-cream money from tourists and leftover waffles from the local diner. When times get really desperate, her mom drags her to a nearby hotel to avail themselves of (i.e. steal) their buffet. 2) It's clear that only good fortune and the watchful eyes of Bobby are helping Moonee skirt around disaster. The fact that she'd escaped danger thus far was a minor miracle -- it's the reason we're not (well, at least I wasn't) all that upset at what befalls Halley at the conclusion of the film. 3) By far the most gutwrenching scene in the film comes when we realize exactly how Halley is able to come up with the rent when she's on the cusp of eviction. With her daughter in the next room. Even one of Halley's "customers" sounds appalled when he realizes this. However, I did catch the trailer after watching the film, and it certainly seemed as if the story was showcased as being lighter than it actually was? Interesting how that is sometimes; I can guess that folks at the studio had understandable commercial concerns, with the lack of a traditional narrative serving as another wrench in the works. You raise an interesting point as far as Vinaite's Halley and whether we might feel sympathy for her situation had we more information about her background. But are these demands that we put on other filmmakers? (Did we start wondering whether Hannibal Lecter had been abused as a kid...?) And it's why I mentioned the character of Ashley, who seems to be more or less in the same socioeconomic situation, but is portrayed as being much more responsible. She's able to make smarter choices about life -- one of which involves severing her friendship with Halley. If Ashley can walk the straight-and-narrow, is it too much to expect the same of others? On that note, can you think of any memorable films that depict the challenges of poverty in modern America? The only one I can think of is the excellent film Frozen River. There's also the Showtime series Shameless (which is set in Chicago), but I haven’t seen it. I’m not surprised there’s not a lot of options, though. Generally, people watch movies to escape from depressing subjects, not explore them in detail. That’s what documentaries are for. I think we can only go so far with defining Halley’s character based on the decisions Ashley makes. For example, unlike Halley, Ashley has a regular job, a goal Halley might find tougher to achieve just having gotten out of prison (this is very much the case in the real world). It could be that Ashley is just a little farther along in the process of getting her life together. All we can do is speculate as to what the situation is. Along those lines, I need to mention Willem Dafoe’s wonderful performance as the calm center of this group of chaotic lives. His acting chops go a long way in holding the film together. There’s a scene where he shoos away a group of large birds who wandered into the motel’s driveway. It’s a very short scene that has nothing to do with the plot, but it’s a nice cinematic moment. But I wonder...what’s Bobby’s story? Why is he there? I think about a movie like The Treasure of the Sierra Madre. In that film, it’s clear what Humphrey Bogart’s character’s dialogue and actions reveal about his inner motivations, which are very different from those of his fellow gold prospectors. His ultimate fate is plainly tied to his morality. For Halley [and, for that matter, everyone else at the motel], the inner reasons and motivations are much more opaque. This movie’s style doesn’t allow for more in-depth exploration, which is too bad because there are a lot of opportunities to look at these characters as people instead of a demographic sample. That being said, I think the ending of the movie went down exactly as it should have happened. There’s a lot of symbolism in the image of youngsters making a desperate dash toward the ultimate source of their dreams/illusions, even moreso if that source is a for-profit multinational corporation. But to me, this film's final moments represent the triumph of a civilized society to help those who cannot [or will not] help themselves or, especially, their children. Sometimes, reality is exactly what’s needed to make things better. Did you see the movie? Want to add to the conversation? Leave a comment below! Share October 20, 2017 • http://chrp.at/1qr9 • Share on Facebook • Tweet This! Next entry: Classic Album Sundays Presents “Is This It” by The Strokes on Oct. 22nd!